Released before Father’s Day—that special time in June set aside for men we call dad, father or pops—the Bell household’s man of honor is Carey Bell. The late blues harpist moved to Chicago the decade after Little Walter and Chess legend Muddy Waters, and went on to play with both as well as many other Chicago blues legends. What better way to pay homage to dad, especially a man the stature of Carey, then with a new album by Lurrie Bell & The Bell Dynasty titled Tribute To Carrey Bell. Paying the tribute is Carey’s son Lurrie (vocals, guitar) and the other siblings—Tyson (bass), Steve (harmonica), and James (drums, vocals). And wait, Charlie Musselwhite and Billy Branch get in on the fun too. Delmark Records picked up Carey for his 1969 debut, Carey Bell’s Blues Harp, so it’s fitting they releasing this special project. The blues is and always will be about storytelling. The first track, “Gone To Main Street,” is all about that “All Yeah” feeling. When you listen closely, you may hear references to The Doors’ “Road House Blues”—I kid you not. “I Got To Go” switches it up, and by that I mean the tempo. “So Hard To Leave You Alone” is a slow tune and again, a great story being told. “You’re my midnight dream, my all day stint,” Lurrie Bell spills his guts and you feel it. It’s the blues baby! Billy Branch takes over on “Carey Bell Was a Friend of Mine,” explaining his love for this man, both on and off the stage. 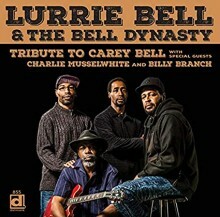 I never heard of Carey Bell before this, but Tribute To Carey Bell made me a fan. Though he left us well over ten years ago, his memory will live as long as the Bell family dynasty has something to say.